For those of you not familiar with risotto, it’s an Italian rice dish that has a creamy texture (due to the arborio rice) and can be made with just about anything. In Italy it’s always served as a “primo piatto”, or first course, and it can be just about one of the best things you’ve ever tasted–if done correctly. Making risotto is quite labor intensive in that you have to stir for about 20 minutes pretty much nonstop! I’ve had so many risottos here in the US that have just been mangled to death. 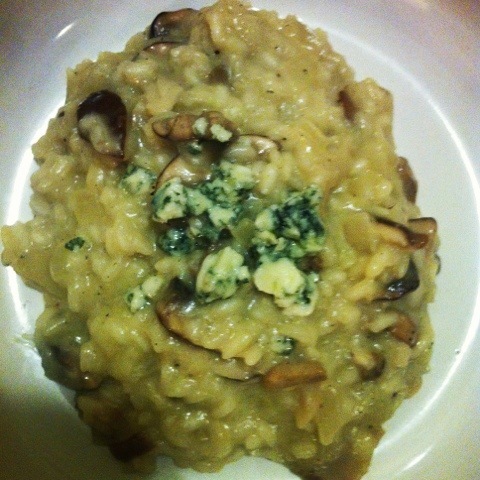 If not prepared properly risotto can go two ways–either it’s too runny or it’s too gummy and thick. A proper risotto should be thick, but not gummy; not mushy, but al dente. It should be creamy and velvety and taste as if you have put a cup of heavy cream in it when in reality there is no cream at all. If you’re making risotto from a package and just letting it sit in a pot until it’s ready then this is not real risotto, my friends. You will be amazed at the difference in texture and taste of a real risotto. Even though this is a bit of work it’s sooo good and sooo worth it. Like I mentioned, it is a labor intensive dish so if you’re not in the mood or don’t have the time then wait to make this on a night when you do. Why I chose this for a Monday night meal after a 3 weekend is beyond me but it turned out great! For 30 minutes or so you are locked into this meal but I look at this as a positive thing. You connect with your food. The labor intensiveness (is that even a word?!) makes the outcome so much more enjoyable. Yeah, you could throw it in a crock pot and forget about it, but where’s the satisfaction in that?! It’s a meal you can feel proud about because you worked so hard on it! I’m using a package of wild mushrooms that include oyster, shitake, and cremini. You can also use dehydrated porcini mushrooms and use the water that you brought them back to life in as stock. It will really intensify the mushroom flavor. The gorgonzola is optional. Some people are not a fan of this pungent cheese, but gorgonzola is much milder than blue cheese and there are so many different varieties. I’ve come to love it recently! Heat up your stock until it comes to a boil, turn down the heat and let it simmer. In another pot, heat up a couple of tablespoons of butter and sweat out your onions. Then toss in your rice and mix it to coat it with the onion and butter. After about 30 seconds or so, pour in about 1/2 cup of the stock and stir, stir, stir. It doesn’t need to be fast or violent, just constant. Do this over medium heat. Stir until the stock is almost completely absorbed and then add another 1/2 cup of stock and keep stirring. Keep repeating this process until the rice is tender and a creamy texture has developed. In the last 5 minutes of cooking add the mushrooms. Cook for another 5 minutes or until rice is al dente. Remove from the heat and add the cheeses and salt and pepper. Make sure you serve this immediately or it will get thick, cold, and gummy. No bueno. Looks like a delicious recipe, but it would be good if it said when to add the mushrooms! Duhhh! You’re right! What a space cadet I am! Sorry about that. Add the mushrooms in the last 5 minutes of cooking the risotto. They don’t need to cook for more than 5-10 minutes! Sounds great! I, of course, would finish it with a bit of chopped, flat leaf parsley – it looks pretty and gives the finished dish a bit of freshness and a peppery presence. Mmmm – looks decadent and delicious!